Samsung announced on Thursday that a collection of cases, covers and pouches will be offered for the Samsung Galaxy S6 and Samsung Galaxy S6 edge. The "Rich Accessory Collection" will feature protective cases made by the top fashion brands in the industry. And sounding like some other tech company which will remain nameless, Samsung says that it wants to unite "the worlds of fashion and technology." Brand names like Burton, Swarovski, Montblanc, Rebecca Minkoff and Romero Britto will be available, with the partners each contributing an accessory that focuses on their strengths. For example, Swarovski will offer "crystal-embellished covers" that show off the different shades of glass on both the Galaxy S6 and the Galaxy S6 edge. Montblanc's contribution will be luxury covers and flip-cases made from leather. The cases and leather pouch designs from Rebecca Minkoff will feature edgy flower prints. Samsung says that all of the accessories are designed to enhance the look of the new handsets rather than cover them up, allowing users to reflect their own personal style. 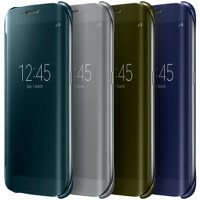 The accessories will be available from Samsung's online store and from retail locations once the two models are launched. The Collection will also include a clear view cover, clear cover, S view cover, flip wallet, protective cover, wireless charger and external battery pack. SEOUL, Korea – March 19, 2015 – Samsung Electronics Co., Ltd, today announced the rich accessory collection for the new Galaxy S6 and Galaxy S6 edge. This robust portfolio of accessories will offer people the freedom to customize their mobile experiences to fit their personal style while enhancing the beautiful and purposeful design of Samsung's newest devices. "Samsung has a long history of designer partnerships and an unparalleled understanding of how technology enhances fashion and how fashion inspires technology," said Younghee Lee, Executive Vice President of Global Marketing, IT & Mobile Division at Samsung Electronics. "The premium accessory collection for the Galaxy S6 and Galaxy S6 edge represents our commitment to uniting the worlds of fashion and technology. Samsung has and will continue to pursue and create innovative, meaningful collaborations with the fashion industry that resonate with the ever-evolving consumer and provide them with essential tools for self-expression." The latest accessory collection will feature designers and brands that share Samsung's goal of authentically merging fashion and technology through accessories, thereby providing consumers with diverse ways to express their style and personalize their devices. The richness of this collection is representative of Designed for Samsung Program that has enhanced the brand's abilities to work with partners to introduce such a broad range of accessories with the new products' launch. Burton: Burton has fueled the growth of snowboarding worldwide through its groundbreaking product lines for active men and women. Now through its collection for Samsung, Burton continues its momentum with vibrant protective covers inspired by two of the brands most popular print designs. Swarovski: Building on a longstanding relationship with Samsung, Swarovski has developed a colorful series of premium, protective, crystal-embellished covers that reflects the different shades of glass in the Galaxy S6 and Galaxy S6 edge. Montblanc: Samsung and Montblanc continue their exclusive collaborative relationship, combining Montblanc's heritage of luxury and craftsmanship with the breakthrough technological innovations of Samsung's Galaxy S6 and Galaxy S6 edge featuring a collection of leather made cases and flip covers designed in the montblanc manufacture in Italy. Rebecca Minkoff: As an industry leader in luxury handbags, accessories, footwear and apparel, Rebecca Minkoff's playful and subtly edgy flower print protective cover and leather pouch designs seamlessly enhance the beautiful and innovative Galaxy S6 and Galaxy S6 edge. Romero Britto: International pop artist Romero Britto has partnered with Samsung for their first-ever artist collaboration. Britto has brought his signature visual language of vibrant colors and expressive imagery to unique, clear covers for the Galaxy S6 and Galaxy S6 edge. "My art brings a feeling of happiness, love, joy and passion," said Romero Britto. "Everything starts with passion and inspiration, and my inspiration for the design was all-encompassing of everything Samsung does in terms of forward-thinking technology. It's a great honor to partner with a company like Samsung that I share a common vision with ? a vision of having as many people share and enjoy our designs as possible." This range of functional and stylish accessories will also feature an array of additional products that will complement the sleek, fashion forward and purposeful design of the Galaxy S6 and Galaxy S6 edge. The extended collection will include a clear view cover, clear cover, S view cover, flip wallet, protective cover, wireless charger and external battery pack. The Galaxy S6 and S6 edge accessories will be available on the Samsung Online Store and other retail locations at the time of Galaxy S6 launch. Eww. No where near the DOT view case of HTC. The clear view cover (number 4) does exactly the same and looks better, but since your fanboyism even reaches out to accessories you're never going to admit that. Fanboy?? LOL!. I own a Z3. And I loved the S6 green but these cases are just ruining the design. Admit it. Why, the phone isn't using the SnapDragon 810. Is it suppose to be? I'm getting number 6 for sure. Minimalistic design while still delivering decent protection. And it's made by Samsung themself so if anything happens to your phone while it's in the case you can use that in your advantage at the service centers. I did that with my S4 too when it got minor damage while it was 'protected' by their 'protective cover+', they repaired the phone without voiding warranty. While other company's claim to sell you "premium" devices, Samsung actually is doing so. The problem is, MontBlanc and Swarovski are expensive for no reason. I did buy the Swarovski back cover for my wife's Note 4, I sent it back because the one I got wasn't the color it was suppose to be; so I have to buy another. I won't lie though, the couple days she had it, I was jealous. I was like, I want one. She says buy one. I said if I did, then I would be ridiculed at work and called gay, because its a girly thing. She was trying to convince me, that well you know you aren't and you bought it because you like it. Whatever they think, screw them. But my phone is white, and the covers don't look as cool on the white model vs the Charcoal Grey. I also wanted the MontBlanc S-Pen for the Note 4, they want over $200 for it. I was like even though I can afford it, I have a line I draw as to what is true value of a dollar. I just don't understand why people by "some" name brand items that have ridiculous prices because some no-name person is on it. But they do look good and make Samsung product look very classy. Great story. For casing, I always buy something in the middle. I don't want to buy something that were break down in a couple of month, and I still can't justify more than US$50 for casing. Once you go with a smartphone without a case or cover, you would never go back. All that case and cover just adds thickness to your already huge phone. Those see-through cases (#4) for the Edge look great!